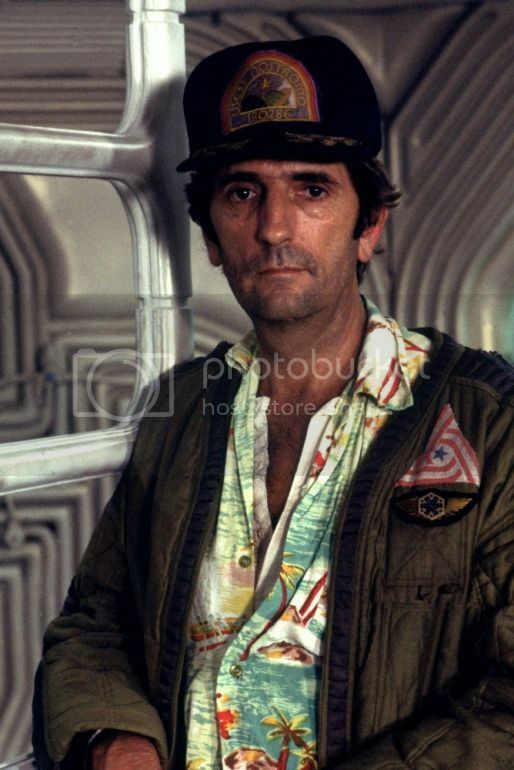 The Aliens Legacy • View topic - Replica of Brett's Hawaiian shirt? Replica of Brett's Hawaiian shirt? Post subject: Replica of Brett's Hawaiian shirt? Since there are Space Truckers over here too I thought I'd repost it in hopes of increasing the odds of getting this thing made. Does anyone here have a clear image Brett's shirt, or know who has the original costume piece? I figure if it were sold by the yard then folks could buy what they need to make a shirt in their size. It's a damned ugly pattern, but then I'm not partial to Hawaiian-style shirts anyhow. Joberg's note about it being made by Manhattan certainly helps narrow the search on Google to shirts that are smilar in style (beach scenes seemed to be their specialty), but alas nothing exactly the same. Trying to recreate this in Illustrator might be possible with the right reference materials, but there just aren't many photos of Brett in his shirt at a high enough resolution. The best would be a large crisp image of the back of the shirt so that we could see the whole image and how it repeats. This is the best I can find so far. A guy I know on RPF named Yuri might have some better, so I've sent him a PM. It doesn't show very much for the shirt, but it has the correct colouring and you can see a good bit of the detail. I have some others that show how the pattern repeats, but nothing that shows the detail as much. Post subject: Re: Replica of Brett's Hawaiian shirt? If you need it emailed to you let me know. Believe it or not, I'm still plugging away at this! Today's odd discovery: there were two of these shirts in the film; the one Stephen210 posted above (which Brett wears during his death scene), and another which he wears during galley scenes. It's the same print, but the pattern lands differently on each, so on the other shirt there's a schooner above the pocket on the left chest where with this one the schooner is actually under the pocket. Interestingly the shirt swaps out during the "acid burning through the floor" scene, and possibly during Kane's death as well. That's not a surprise though as they'd need multiple shirts for multiple takes. The one on the left has a hut on the pocket and no schooner above it, same as the one in Bob Burns' collection as photographed by Stephen210. The one on the right has a tree in bloom on the pocket, and the schooner is visible. Same pattern, just aligned about 5" differently on the shirt. The other big breakthrough is that it is a half drop pattern. I've been beating my head against the screen trying to figure out how the pattern repeats when the various elements seemed to be all over the place. I just whipped this up in Paint so it isn't perfect, but trust me when I say this really makes a difference. I'm still working to perfect the pattern of course. These examples come from a member over on the Prop Summit who's shirt follows the same pattern, just with different colors and more detail. It seems this layout was popular enough to be mimicked. In fact, Xander on Buffy the Vampire Slayer wears a third variation of this shirt pattern in the 5th season opener, "Buffy Vs. Dracula". I couldn't find a decent screen-grab, but it's there! CEERKAY, FABRIGO, and NETWORK brands. So for anybody looking, try searching Hawaiian shirt, then filtering to (blue, green, and multicolour) and used. I found mine on Etsy last year. It is the Network brand. Not 100% but close enough for me! I was at Wal-Mart the other day and saw some Hawaiian shirts and one was sooo close to Brett's that I actually stopped and almost fainted. Why oh why did they have to splash "Bahamas" in pink all over this?